Interactive Slot Machines at the Lion Slots Casino! Lion Slots Casino as Presented by Gambling World! Lions are known to be the King of the Jungle. 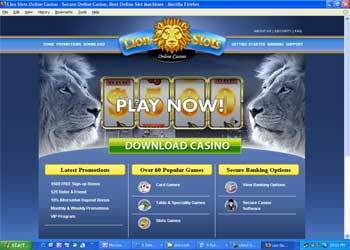 The Lion Slots Casino in known to be the "King of Online Casinos" in some circles. Known for the uniqueness of their games, casinos that use software from Rival Gaming have grown quite fast in recent months. Many players comment on how fun their slots are. The biggest draw for many regular players at Lion Slots are their interactive line of slots call iSlots. Filled with excitement and thrills these slots have bonus rounds with an extra twist. Based upon the choices you make during the game, can actually change the outcome of the storyline, and therefore the game can be different each time you play it. In addition to the iSlots, they also have 3 reel slots as well as a mixture of multi-line video slots with bonus rounds, wild icons and scatters very much like you find in the slots at other casinos. You can also play tables games or card games if you like throwing the dice or spinning the roulette wheel or betting against the dealer in a game of blackjack. Lion Slots Casino has been growing quite a bit although they are a fairly new casino online. They have a very knowledgeable staff and the customer support knows how to treat visitors well. For the time being they are offering a 100% first deposit bonus up to $100. In addition to that they also have guaranteed second and third deposit bonuses as well. There is no better time than now to download the software and start playing and you too can take advantage of the welcome bonus. Just click on the simple download link below this review and you can be playing in the casino in minutes.